VD-151 Small Horizontal Evaporator Medium sized refrigerator or small freezer, closed evaporator with door. Cooling capacity: 9 cubic foot refrigerator Dimensions: 10.75"L x 7"H x 11.25"D Ship Weight: 10 lbs. Includes 15 of copper tube set, thermostat assembly, 2 horizontal ice trays and installation hardware. Cooling volume up to 9 cubic feet with 3" of polyurethane insulation - 40% on time, 3 cubic foot freezer with 4" of insulation - 50% on time. Medium sized refrigerator or small freezer, closed evaporator with door. 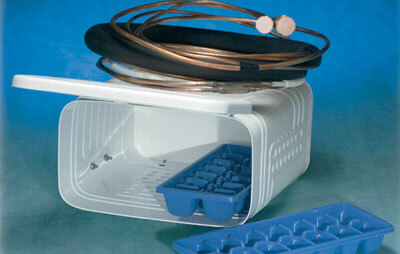 Includes 15 of copper tube set, thermostat assembly, 2 horizontal ice trays and installation hardware. Cooling volume up to 9 cubic feet with 3" of polyurethane insulation - 40% on time, 3 cubic foot freezer with 4" of insulation - 50% on time.